The Commissioner of School Education Andhra Pradesh (CSE AP) has successfully conducted the Andhra Pradesh Teacher Eligibility Test (AP TET-2017) examination in 13 districts of AP state. Lakhs of aspirants wishing to become teachers have appeared for the AP TET examination 2018 during the conducted schedule in the month of February. This year hugely, 4,46,833 aspirants have applied for AP TET examination. In which, 4,10,828 aspirants have appeared for the examination. Nearly 91.94% of aspirants have appeared for the AP TET examination this year. Comparative to the last years, this year the number of applicants and the appeared candidates number was tremendously increased. Commissioner of Secondary Education Andhra Pradesh has successfully conducted the Andhra Pradesh Teacher Eligibility Test (APTET-2018) examination on 21st February to March 3rd in various examination centers. The Andhra Pradesh TET examination has been conducted for Paper 1, Paper 2 and Paper 3. APTET held at several examination centers across the Andhra Pradesh. A huge number of hopefuls have attempted APTET Paper I, II and III. Also, few of the aspirants have attempted both the papers. Candidates aspiring to become a primary and secondary school teacher in the state of Andhra Pradesh have given the test. Also, the Commissioner of School Education Andhra Pradesh has released the APTET Final answer key 2018 after the examination completed. Candidates attempted the examination have estimated their probable score and waiting for APTET Result 2018. The AP Education Commissioner has recently announced that the TET exam results will be available soon on its official website, cse.ap.gov.in. The APTET result will be announced on 19th March for all papers. Candidates can go through the article to check details about APTET cutoff marks, merit list, and other information. Recently CSE AP has issued an official notification for DSC Teacher posts for Primary and Secondary Teacher positions. Candidates need to qualify in TET examination to get the job as a primary and secondary school teacher in the state of Andhra Pradesh. The aspirants applied for Andhra Pradesh TET examination has appeared for the examination in allotted examination centers. APTET Paper 1 has been conducted in morning session and APTET Paper 2 has been conducted in afternoon session. Aspirants appeared for the APTET results 2018 can wait until the result date is announced by the CSE AP. Tentatively, the APTET result 2018 for Paper 1, and Paper 2 are to be release on 19th March 2018. Candidates can keep checking the CSE official website, cse.ap.gov.in. Candidates attempted the APTET examination must have to score the minimum cutoff marks are said to qualify the examination. 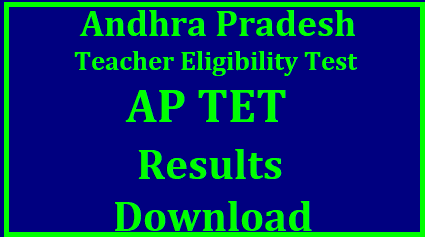 The Andhra Pradesh TET will also announce the APTET Cutoff Marks 2018 along with the result. The cutoff marks will be depending on the number of posts, number of hopefuls competing, category of the candidates and various other factors. Candidates can check APTET Result, Cutoff marks, and Merit List 2018 at cse.ap.gov.in. For Paper I, II, III Visit official website cse.ap.gov.in or https://aptet.apcfss.in. Search for APTET 2018 Results link on the home page and then click it. You can download APTET Result 2018 for Paper 1, Paper 2 & Paper 3 along with the rank, and score obtained in the examination. Candidates who clear the AP TET examination with required score will be called for the counseling. Candidates those who are going to appear for the AP TET counseling need to carry all the required documents such as originals and document copies of educational certificates, AP TET hall ticket, AP TET scorecard and others. Candidates need to carry the original set of documents along with 2 Xerox copies of documents while going to the counseling.